Manus McLoughlin, third year primary school teaching student is aiming to be the first person to assume the position. “When I read what the position was, I immediately thought it fitted me. It’s the role of the Education and Placement Officer to provide support for all students on placement, that being said I’m not going to ignore those who aren’t on placement,” McLoughlin said. This role will be introduced to support student nurses, teachers and INTRA students on placement and will also target education and study issues. The Education and Placement Officer will be based on the St Pat’s campus. McLoughlin wants to see end of semester one exams moved before Christmas, a change DCU President, Professor Brian MacCraith previously alluded might be already in the works recently at Class Rep Council. In his manifesto, McLoughlin stipulates that students on placement need to have supports to look after their wellbeing while on placement. “I’m going to provide services such as placement and wellbeing packs to students . As well as that, I’m going to fight against unfair placement requirements, just because they’re requirements doesn’t mean we can’t fight against them. I’d like to lobby for longer placement office opening hours,” McLoughlin outlined. Fellow St Pat’s student, Stephen RIxon is the only candidate running against McLoughlin. 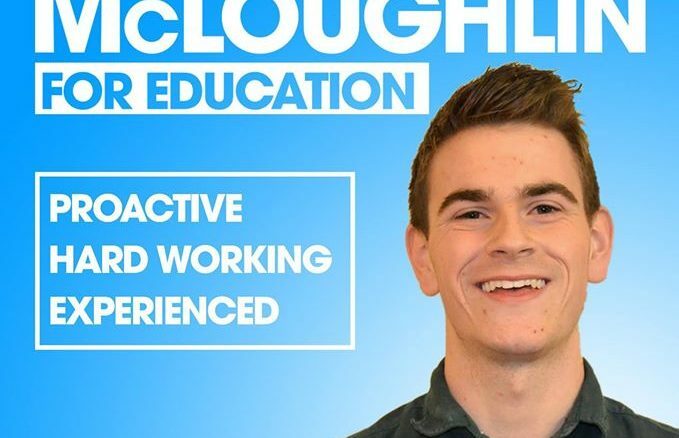 Like his only opponent for the position McLoughlin wants to introduce financial supports for students on placement. “It wouldn’t be too much of a thing to do to provide the students who are going on placement, say give them €50 into their printing credit,” he said. McLoughlin would also like to organise a shuttle service for students travelling to placement. “Taxis are what a lot of students are having to do. I ran shuttle buses a few years ago, they cost us a lot of money, we lost a lot of money, we didn’t run them this year. I believe I have the skills next year to take them and run them again for the students,” he explained. While the role is based in St Pat’s if elected, McLoughlin would like to rotate between campuses. “It would be a bit silly to just base me down there the whole time. I would love even if there was one hour a week I could be up in office here in DCU. I really don’t want to be absent from DCU considering they have so much to offer and there’s actually so many more people on placement here than there is in Pat’s in total,” McLoughlin said. McLoughlin looks at the impending amalgamation favourably and wants a harmonious merging of Students’ Unions. “Building a working community as four colleges come together is no easy task, I plan to sustain and develop these identities that each college brings with it. The amalgamation I believe it’s the best thing that’s ever happened,” he said.